From I-64/40 or I-44: Exit at Grand Blvd. Drive north on Grand Blvd. Turn left on Olive St.
Click here for driving directions to the Nine Network. Metro Transit is best known as the operator of the public transportation system for the St. Louis metropolitan region, with MetroLink, MetroBus and Metro Call-A-Ride. 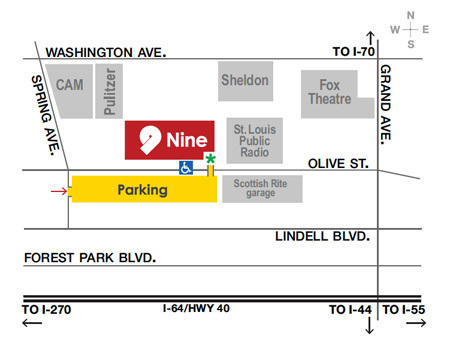 Plan your trip to Nine using Metro Transit. At the front door of the station, press the buzzer on the wall to your right. Identify yourself and tell the receptionist the purpose of your visit.